I got a big bag of Milky Ways last year to pass out to the neighborhood kiddies on Halloween. It was the first bag of candy I've ever bought in my whole life. It simply never occurs to me to buy candy, even though I like the stuff as much as anyone. I've bought some candy bars in my lifetime, but never a whole bag of it. It seemed so indulgent! "It's for the kids," I reminded myself. When my husband got home his eyes widened to saucers. "Where did this come from?" "Yes, but it's not for us, it's for the Trick-or-Treaters." His eyes pouted slightly, but he seemed resigned. I relented. "Well, I guess we could have a piece or two." "Just to see if it's any good, right?" he reasoned, thoughtfully. Wrappers flew. Our candy gorging knew no restraint. We turned off the front porch light before a single Trick-or-Treater came by. Yes, dear readers, the stash was gone. To stave off a repeat performance, this year I'm vacillating between buying either two bags or none at all. What do you hand out for Halloween? Our dentist gives out travel tooth brushes and paste. This year, I bought super miniature organic chocolates that are less than bite sized. Once I reached my max budget on that, I found a bag of a mixture of mini candy bars on sale half price. I suppose I could buy those awful orange and brown taffy things... and then nobody would ever Trick-or-Treat here again :-D.
Whoa, you live in a happenin' place! On a good night we'd probably see a dozen or two kids (that is, if we left the front porch light on, hehe). The *joys* of living downtown of your city! Lots of trick or treating without having to cover much ground. My husband has a tradition of keeping record of costumes he sees every year. He asks every kid who comes to the door what they are supposed to be. Makes for an interesting survey on figuring out what is the most popular costume for that year! I predict a bunch of Iron Mans and Batmans (Iron Men and Batmen? hehe). I don't even know what the girls are into these days. Oh my gosh that's hilarious! I can just imagine the look on the kids' faces who got sugar packets (and on their mom's faces, hehe). That's rich. Yeah, I actually don't want leftovers this year. I'm determined to wear a nice new sweater on Thanksgiving that doesn't look like a tent :). Hehehe, that's awesome. 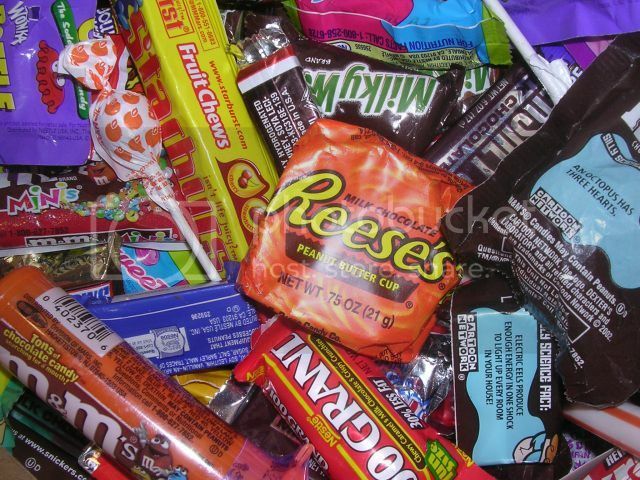 When we were young, my parents would allow us to have our "own" candy stash on Halloween night, but the day after it went into the family pile (when we got a bit older, the day after it would be donated somewhere). I have a tendency to hoard, so I could easily make my Halloween candy last a year, but once it went into the family pile I had to say goodbye :-D.